The Healing Field is an item in Super Smash Bros. Ultimate. 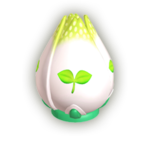 It takes the appearance of a large bulb that can be thrown by players, and, once it lands, it will open up and create a small green field that heals players inside of it. It heals the player who threw it for 2% damage per half second, and any other player is healed for 1% damage per half second. This page was last edited on March 5, 2019, at 22:57.